Inspired by classic Mission, Arts and Crafts designs, this three tier Tiffany-style console table lamp features hand cut stained glass in yellow and amber. This Mission, Arts and Crafts table lamp features Tiffany-style glass with an organic vine pattern. It's a handsome look for any decor, perfect for creating welcoming, cozy light on side tables or dining room console tables. It features three lead-free, rectangular-shaped art glass diffusers in yellow and amber hues. In-line on-off switch. Overall: 37 1/2" high. Base is 8" wide. Takes three 60 watt standard base bulb (not included). In-line on-off switch. Tall table lamp for side tables and more. Tiffany-style art glass shades with over 120 hand-cut glass pieces; made using the copper foil technique. Perfect style and size for my décor. Looks beautiful. Perfect height for our tall corner area that needs a touch of uniqueness, color and light. We'll be using lower watt bulbs to simulate candle light. Appearance is a combination of traditional and contemporary in one lamp. I really appreciate the design and details found on the glass fixtures. What is the height of each tier? Overall it is 37 1/2” high but it doesn’t say the height of the two shorter tiers. BEST ANSWER: The middle tier is 29 5/8"H and the bottom tier is 21 5/8"H.
Tier 1. 37 1/2 "
Each glass light shade is 8"
Each tier height drops 8"
Lamp looks beautiful on the entry table which is Mission style. LED bulbs in the light amber tint make the amber shades pop! We like this lamp but would like to have the shades more creamy than yellow. Is there a choice of shades? BEST ANSWER: Hi - there are no other shade options available in the collection. 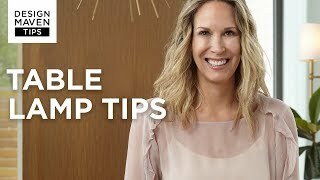 Depending on which type of bulb you use (warm color, daylight color) will affect the color tone of the glass. Bulbs you decide to use may help with the color tone. Best to play around with the different ones to see what you like best from cool tone to warm tones. Wattage also comes into play. Showroom should have a few to demonstrate with before buying. 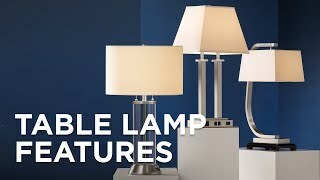 can you use led bulbs in this lamp, and if so, what would be the maximum outage? Yes I used LED bulbs in this lamp：8.5W & 800 Lumens. Do the lights turn on independently of each other? BEST ANSWER: They all come on/off together at once. All three turn on together , there are no individual switches. I love mine , it looks great ! it is mellow like candlelight, arts and craft style tiffany, but adds significant brightness to a dark corner. This is like adding a piece of art to your home. It is very attractive. Goes perfect with warm colored furniture with a western flair. Our living room is western themed and the lamp bridges the gap between "Rustic/Traditional" and "Modern" design perfectly. It looks modern and will highlight everything around it in a wonderful way. I needed an accent light for a corner niche that was about 4 feet tall. This light fit beautifully and really illuminated that corner. 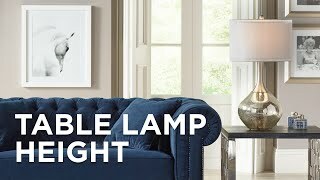 Always impressed with LampsPlus. Long term customer, love the service and the selection. We needed a tall lamp because out ceilings are high..This hits the spot. A beautiful lamp. I only wished it had a 3 way switch for more lighting options. 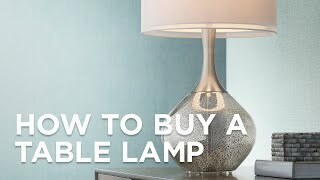 I purchased this chic lamp for my office. As a psychotherapist, the office needs to be comforable and elegant. This lamp immediately draws attention and praise from my colleagues and clients. The simple design matches easily with my furniture. It provides warm shade of light day and night. Beautiful and functional! We love it! We put this lamp in a dark corner in our living room. It lights the space beautifully! Everyone who visits asks us where we purchased this beautiful lamp. 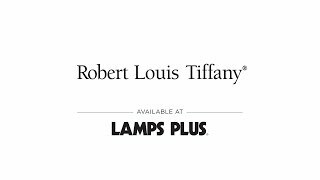 I would and have recommended Lamps Plus to anyone looking for quality and style in lighting fixtures. Thank you! An art glass shade with a dragonfly pattern accents this Tiffany style table lamp for a stunning traditional look.